Styled with chalmers sweater and cohen pant wool . See this in Wool Blend or Wool-Cashmere Blend. Love this coat. Looks fantastic dressed down with jeans and sneakers or dressed up with dresses and boots! Bought this coat in pink; gorgeous color. So soft itès amazing. I don't give a five stars just because it shed so so so much it's crazy. I have pink treads every all over my car, my clothes, it's just too much. Otherwise it's a perfect gorgeous so so soft coat. Love it. The spring is late in Canada as usual, and this coat it perfect for it. Warm, runs a bit big had to order xs because s was way too big. Very cute buy. I got this in a pink color which I love. My only concern is that the fur sheds way too much. But otherwise it’s a very good coat. I can’t tell if I bought a small or medium. Tag said medium label on coat says small. It’s slightly small on me but it is a gorgeous coat and I’m keeping it. It feels luxurious! I bought the navy blue. I want another! Beautiful, luxurious but sheds to much. Very warm and cozy. Beautifully cut and fits well. Got lots of complements on this coat. The color is very flattering on. Would definitely recommend this coat. Love the color and length of this. However the amount that it sheds makes the coat not worth it. I read in previous reviews about the shedding but thought it would be manageable, however it rubs off on all clothes, bags, and furniture everywhere I go! In love with the style! I was not sure to buy this coat for the color and because I read in the comment that it was shredding a lot (the fur) however I’m VERY happy about my purchase. The look is lovely, and the color is not too blue, it’s just perfect marine. I wear it with a fur scarf. 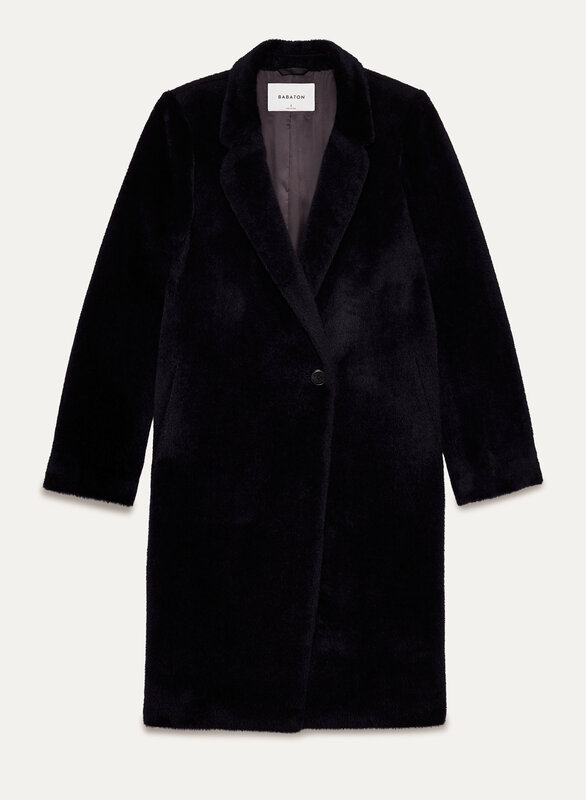 This coat takes on a life of it's own and enhances any outfit. I have gotten so many compliments on this coat and the color is spectacular. 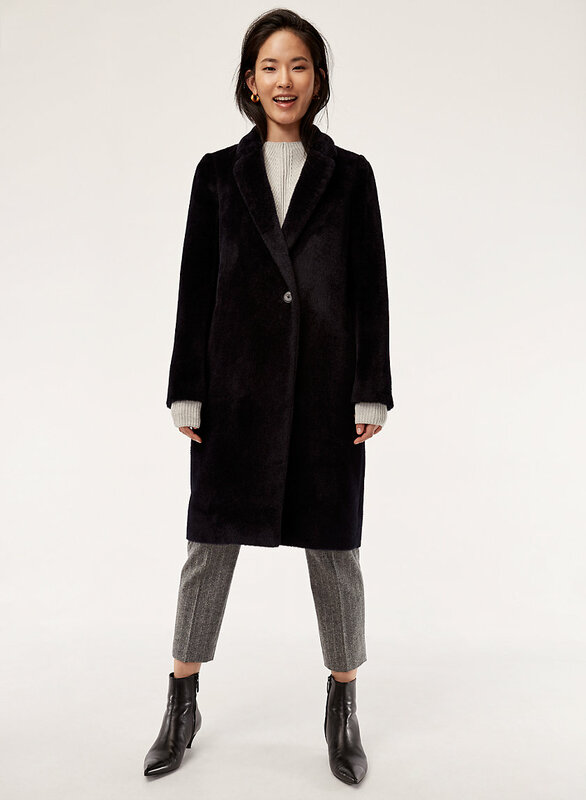 I'm wearing this coat in the navy blue right now and let me tell you something. I had been debating getting it for about 3 weeks and then it went on sale and hell yes you better believe i got it immediately, and let me tell you that was the best winter decision i've made in a lifetime. It's oversize enough for layering, it looks chic high qual, and i'm sure it'll transition perfectly into spring. If you're debating it just buy the coat...it's fire. Over sized fit which is very trendy this year but it doesn't look like I'm wearing my dad's coat. Xxs fits me very nicely. I'm a petite girl and it hits around my knees. The color is beautiful deep vibrant red. I’ve gotten so many compliments on this jacket. I got it for work but I love the way it looks on weekends thrown over jeans and an oversized t shirt or hoodie. I didn’t know if I *really* needed another coat but the winter is long and it’s nice to break up your looks. I sized down and can still wear a blazer under the coat quite comfortably. Tip: a $40 hand held steamer gets out any kinks or wrinkles! I ordered the navy; however, it is so dark it almost looks black. It was soo wrinkled when it arrived, I had to get it steamed. I like the material and look of the coat. I would definitely recommend! This coat both looks and feels luxurious, able to be styled with a number of items. It is the perfect combination of classy and comfy. The only downside to the coat is the minor shedding due to its fabric. The wool, as wool often does, clings to surrounding material and can leave your nose feeling itchy if worn for extended periods of time. 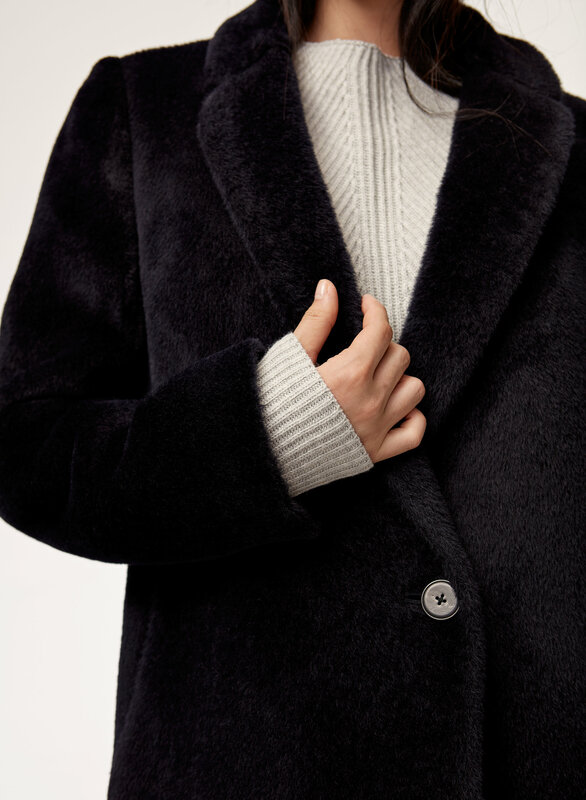 Other than that, this is a great coat for the cool days of winter and fall. A beautiful, comfortable, elegant coat! It is well made; the alpaca blend is so soft and cuddly! LOVE this coat so much.. BUT! This coat design, fit and colour is amazing!! I love that I can dress it up for work or a night out with friends but also throw it on with a pair of sweatpants and feel equally just as fabulous!! Its very versatile. However, and this is a big draw back to buying this coat.. It sheds really badly. It looks terrible when you wear dark clothing underneath and take off the jacket and you are COVERED in wool hair. For this reason alone, I can not recommend this product to friends and would think twice before buying anything in this fabric. I loved this coat when I bought it. I have it in the Row Red and it looks lovely and is very soft but it is almost impossible to wear because of the constant and abundant shedding. I was covered in red fuzz after just carrying it on my arm while I waited for a flight at the airport. Instead of standing out because of my great red coat I stood out because it looked like a giant red cat had rubbed all over me and my luggage. I have tried brushing it with a soft natural bristle brush to get rid of excess loose hair but I have been brushing it for over an hour and it continues to shed non-stop. A very expensive disappointment. A great coat. Came with a few wrinkles that just WONT come out. Other than that. It’s amazing. Warm. Soft. I love the fit. The alpaca whool is warm and luxurious. I bought it in two different colours (navy and rosemont) and they both look so beautiful. I find it slimming, comfortable and warm. The cut is simple, perfect and flattering. It canlook casual or dressy. The fabric wears well and I love the choices of colours. It feels light, comfortable and warm. Really nice coat. very light and warm. Sleeves are a bit too long for me, but overall decent fit. If you’re weight 100-110, 5’4, get xxxs because it runs really big! !also get it at the store if possible it got really wrinkly as it was squeezed in the plastic bag. I have the regular Stedman wool coat that I wear nonstop. While I do love it, this one is WAY warmer (has a lining) and is in a great material. The alpaca hair and the red makes for an amazing statement coat that isn't too crazy! I wear an XS in the original Stedman and an XXS fit me in this. I love the fit and quality of this coat. Love this coat! Sheds a bit at first but stops after a few wears. Super luxurious fabric and fits really nicely. A true classic piece and high quality material. This is a coat for life! I got this coat in the camel colour. It’s a very beautiful coat, and nice and warm... but my god the SHEDDING! !I actually can’t wear this anywhere without bringing a lint roller. When I shake out the coat, there are clouds of hair everywhere. Forget wearing anything black with it. I’m hoping it stops shedding the more I wear it and shake it out. The fit is a bit larger than the other steadman coats. Size down.